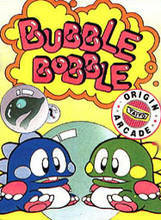 Bubble Bobble is an arcade game by Taito, first released in 1986. It was ported soon for numerous home computers and game consoles. The game features twin Bubble Dragons, Bub, who is green with yellow spikes/horns and Bob, who is blue with cyan spikes/horns. Together, they journey through the Cave of Monsters to rescue their girlfriends. They move over a system of platforms, busting and pushing bubbles, avoiding enemies and collecting a variety of power-ups.